Coca-Cola has become the first brand to pay for an emoji on Twitter, with a picture of two Coke bottles clinking coming up when a user types #shareacoke. 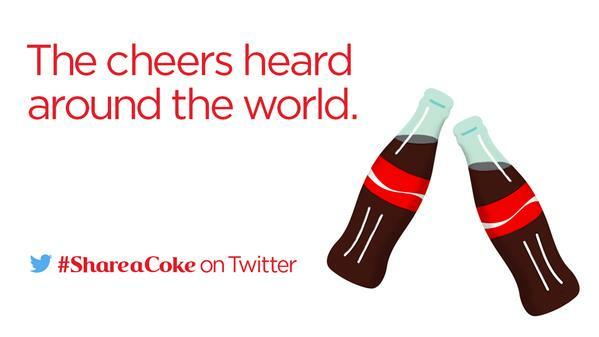 After the emoji went live on Friday, Coca-Cola claimed a record for the "largest Twitter 'Cheers!' "
Twitter has in the past created the same function for "Star Wars" and the MTV Video Music Awards, but this is the first time it has been part of an ad deal, according to TechCrunch. Ross Hoffman, senior director of global brand strategy at Twitter, told TechCrunch: "Coca-Cola is a massive global partner of Twitter and they have been pushing us for some time on building a custom emoji." The ad buy follows a wave of brand creative picking up on the popularity of emoji including McDonald's featuring pre-existing emoji in ads, Ikea creating its own set of emoji and WWF theming an endangered animals campaign around them. Polls vs. moments: Which new Twitter feature has agencies buzzing?